Why Historic & Beautiful Holly, Michigan? Located just 50 miles from the city of Detroit, you’ll feel like you’re ‘up north’ in the Village of Holly. 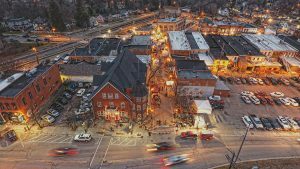 Known for the small-town feel, abundant recreation opportunities, and quaint, historic, charming Downtown, the Village of Holly is the place you’ll want to call home. Visiting this close-knit community of around 6,000 residents is like stepping back in time – friendly neighbors, a vibrant Downtown, and plenty of social activities. The Village of Holly is a Main Street Community. We pride ourselves on our history and commitment to preservation. A classic car cruise takes place every Wednesday evening during the summer, and the Dickens Christmas Festival is held in December. There are events to attend year round. If outdoor recreation is of interest to you, you’ve found the perfect place to spend your days. Fishing, hiking, biking, paddling, and more – we have it all. So much to see and do! The Village has several parks where visitors and locals spend time together. The Farmer’s Market is held on Sundays, and the Parks Commission sponsors live music under the pavilion throughout the summer. Playscapes for the kids to enjoy, or a quiet place to read a book near the lake – there’s a park for that! The dining and nightlife scene is quite eclectic in Downtown Holly. 5-star cuisine, an award-winning brewery and gastropub, family diners, a coffee shop where the beans are fresh-roasted on site, an old-fashioned donut shop, live music on the weekends, and a laugh-a-minute comedy club – plenty of options to keep you coming back for more. Downtown Holly – welcome home.